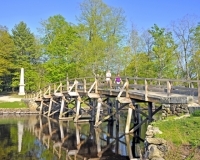 North Bridge, Concord, Massachusetts in Spring. "Here once the embattled farmers stood and fired the shot heard round the world." 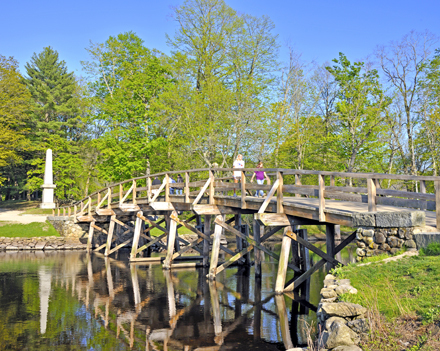 When the British Regulars met the colonial militia at this site, they knew that they were up against a worthy enemy. The site is now part of Minute Man National Historical Park. 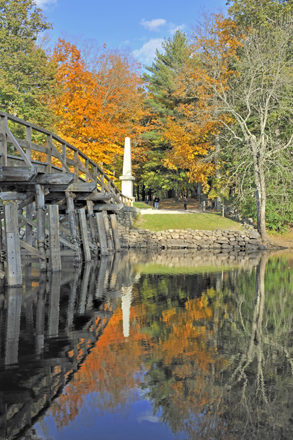 North Bridge, Concord, Massachusetts; Fall view. North Bridge, Concord, Massachusetts; In winter. 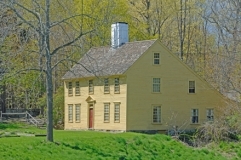 Parson Barnard House (1715), North Andover, Massachusetts; Spring color. 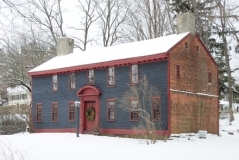 Charming 18th century saltbox with elaborate pilastered center chimney. 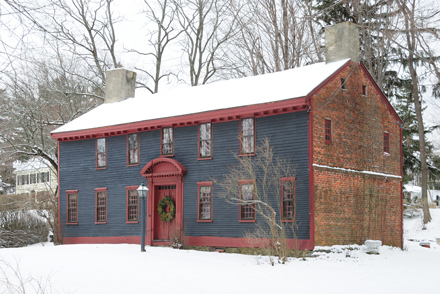 Parson Barnard House (1715), North Andover, Massachusetts; At end of winter. 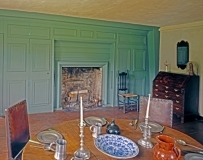 Parson Barnard House (1715), North Andover, Massachusetts; Interior of parlor chamber showing early Georgian (bolection) molding on hearth wall. 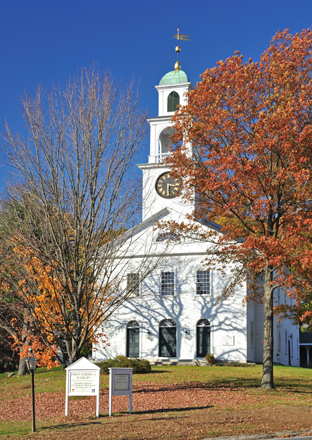 Rocky Hill Meeting House (1785), Amesbury, Massachusetts. 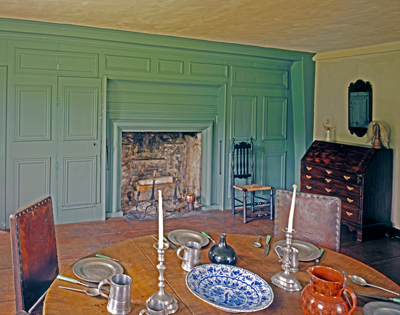 Fine example of an eighteenth century meeting house showing some pretension or ornamentation, especially in the protruding porch/entrance. Rocky Hill Meeting House (1785), Amesbury, Massachusetts; Front elevation showing parish house. 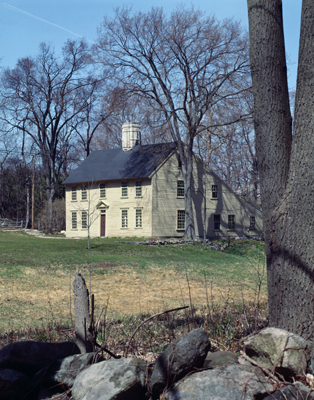 Rocky Hill Meeting House (1785), Amesbury, Massachusetts; View from southwest in spring. 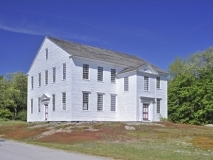 An interesting comparison is with the Rockingham Meeting House, Rockingham, Vermont, in the 18th Century Maine and Vermont gallery. 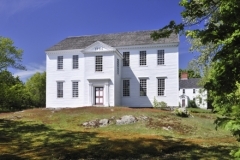 The latter has end stair porches while Rocky Hill's salient feature is its center porch with pediment and door entablature. Both were unoccupied for some decades, not altered to suit then-current fashion, which preserved the historic integrity of the structures. Rocky Hill Meeting House (1785), Amesbury, Massachusetts; Front elevation showing parish house in spring colors. Royall House (1737), Medford, Massachusetts; East facade and south end. 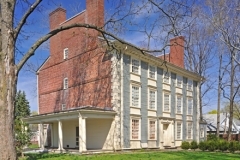 The elegant Georgian east facade displays Isaac Royall's wealth acquired in the West Indies. Modillioned cornice, quoins, spandrel panels, pilastered front door. Outline in brick of original house enlarged by Royall shows on south end. 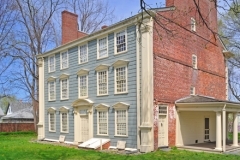 Royall House (1737), Medford, Massachusetts; West facade and south end. An excess of Georgian ornamentation crammed on to this side of the house. Giant pilasters of three stories, angular window pediments, rusticated wood panels and an elaborate segmental pediment supported by Corinthian pilasters are all present. 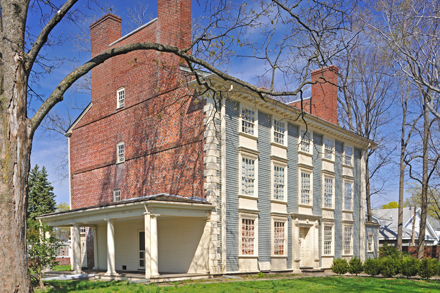 Again, the outline of the original narrow brick house on the site can be seen on the front portion of the south end. 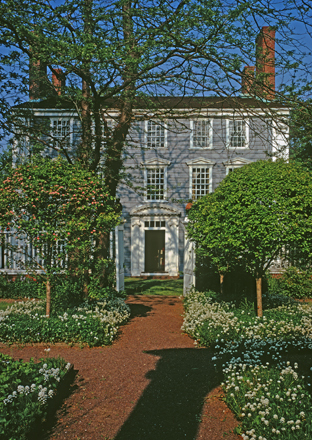 Royall House (1737), Medford, Massachusetts; View of west facade through garden. Spring flora and a garden path lead to the entrance of this fine colonial mansion. 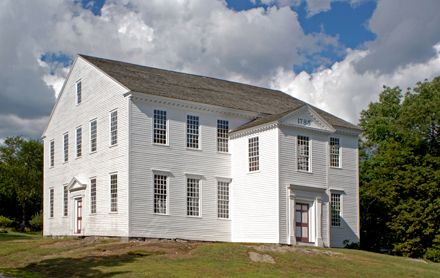 First Parish Meeting House (1797), Sudbury, Massachusetts. 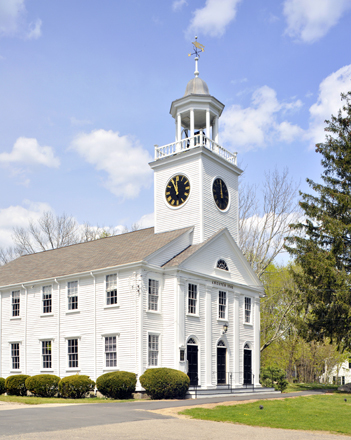 Fine example of the New England meeting house with three-stage tower, cupola and weather vane. 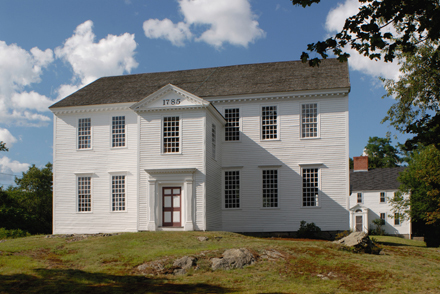 Second Parish Meeting House (1742), Hingham, Massachusetts. Pilastered facade pavilion, clock and balustraded bell tower-cupola with weather vane. 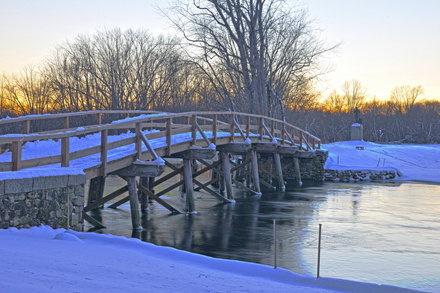 Short House (c1732) Newbury, Massachusetts; Winter view. Brick-ended with end chimneys, gray clapboards, red trim and elegant segmental pediment over front door. West Parish Meeting House (1717-23), Barnstable, Massachusetts. 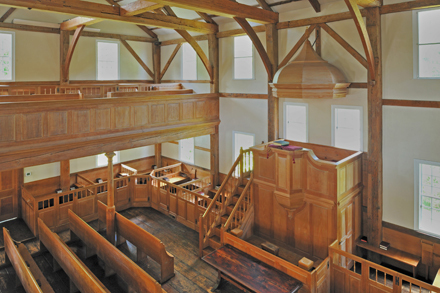 The original meeting house was enlarged in 1723 when the tower and belfry were added. 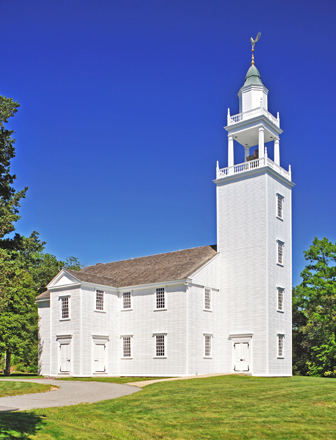 There are two stages atop the tower: First a balustraded base for the columned belfry; Second another balustrade surrounding a blind-sided cupola surmounted by the weathercock. West Parish Meeting House (1717-23), Barnstable, Massachusetts; Interior showing pulpit, sounding board (canopy), gallery and pews; and structural elements: posts, tie beams, braces and plates (outer horizontal beams). 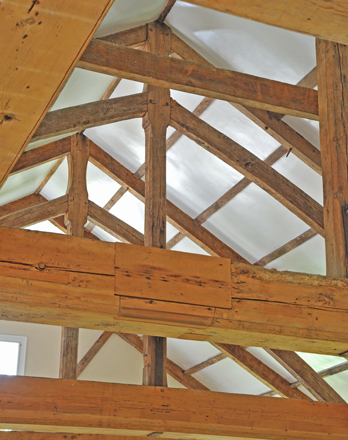 West Parish Meeting House (1717-23), Barnstable, Massachusetts; Interior structure showing king posts, curved braces and tie beams. 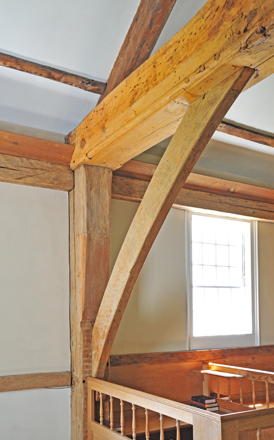 West Parish Meeting House (1717-23), Barnstable, Massachusetts; Interior structure: post, plate, chamfered tie beam and curved brace.